I love Jasmine's long black braided hair. She really has a unique look that's separate from some of the other princesses. 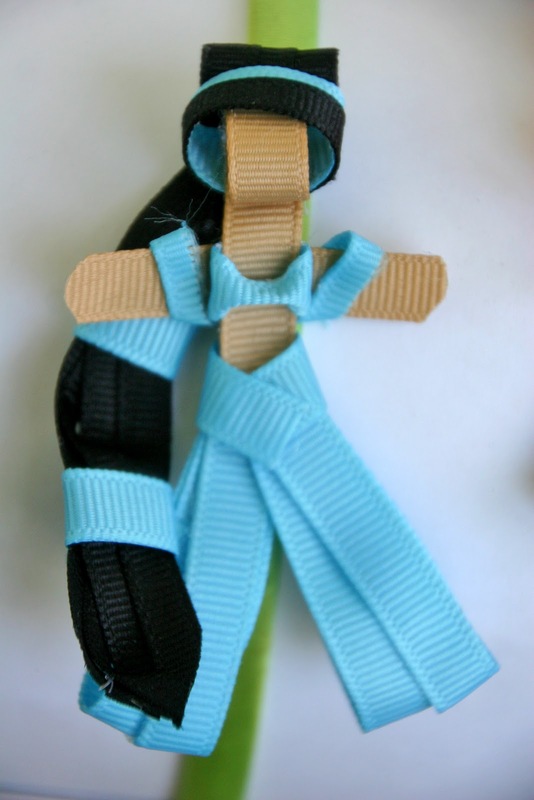 Black: 2", three pieces of 1", four pieces of 4"
Blue: 2", two pieces of 1", three pieces of 1½ ", four pieces of 4"
Step 1: Roll tan 3" piece of ribbon into a circle and glue. This will be your head. Step 2: Cut tan 2¼ " piece at each end so that the tips are rounded. Spray with no fray spray. These will be your arms. 3. Take your 2" piece of blue and your 2" piece of black and overlap leaving blue showing beneath black. Glue together. 4. Wrap around head and glue ends to back of head. 5. Glue your three pieces of 1" of black ribbon side by side. Then fold in half and glue to top of head. 6. Take your four pieces of 4" black ribbon and glue two together side by side in pairs. 7. Over lap in an upside down V and glue. 8. Overlap left over right and glue underneath hair. 9. Over lap left over right again and glue underneath. 10. Glue ends together at bottom. 11. Cut ends of ribon in a curved point. Spray with no fray spray. 12. Take two pieces of your 1½ " blue ribbon and wrap around black ribbon at the narrowest points and glue ends to back of ribbon. 13. 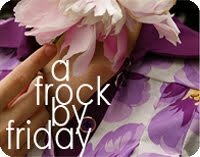 Take one of your 1" piece of blue ribbon and pinch it in the middle and glue. 14. Wrap blue ribbon around body and glue ends in back. 15. Take your other 1" piece of blue ribbon and cut in half lengthwise. Spray with no fray spray. 16. Wrap around arms in a V shape leaving enough space for your body to lay between. 17. Glue ends to back of arms. 18. 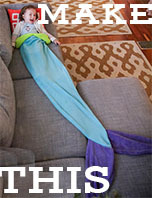 Turn over and glue down body to front of arms. 19. 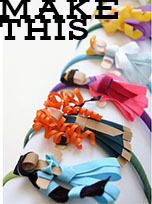 Take your four pieces of 4" blue ribbon and fold in half gluing ends together. 20. Take two of those piece and glue together at the ends in a V shape. Repeat with other two pieces of blue ribbon. These are your legs. 21. Glue legs to back of body in a V shape. 22. 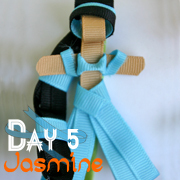 Glue last piece of 1½" blue ribbon to the front of Jasmine's waist at an angle. 23. Wrap ribbon around back and glue end in front at an angle. 24. 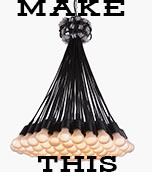 Take your braided hair piece and glue to back of head. 25. 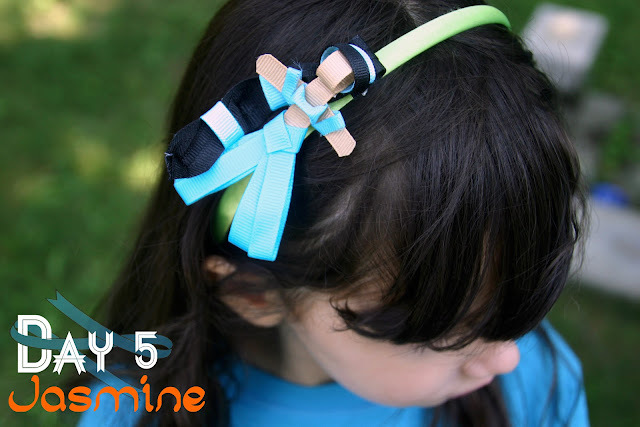 Wrap braid around to front and glue the side of the braid to the side of Jasmine's legs.